Four men took a photo on a front porch this weekend and it was almost too much for the internet to handle. 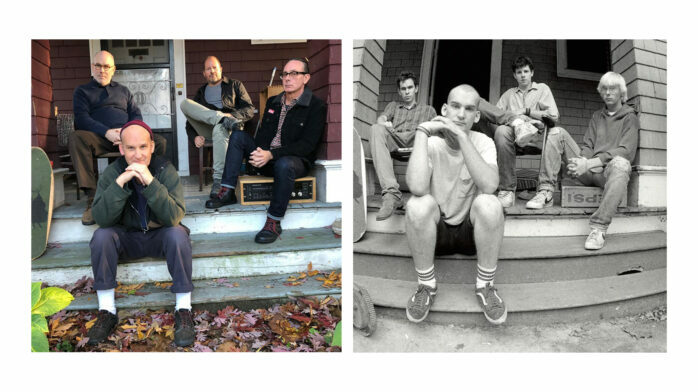 The front porch was of Dischord House in Arlington, Virginia, Dischord Records, and the four men were named Brian Baker, Ian MacKaye, Lyle Preslar, and Jeff Nelson. Brian, Ian, Lyle, and Jeff used to be in a band together and they decided to reunite to take recreate the photo on the cover of their 1985 EP Salad Days. Brian Baker posted the photo on his Instagram with the caption “Senior Threat,” but don’t read anything into it, Minor Threat is not getting back together. And before you ask, no, Ian’s other band, that also broke up, is not getting back together either.